Security guard cover letters are written to match the specificity and authority of the resumes they mirror. Download the sample below to get started. In a hurry? Our state of the art cover letter builder can help you write a convincing cover letter in minutes. Your company recently advertised on the Website’s Name website for a Head Security Officer. 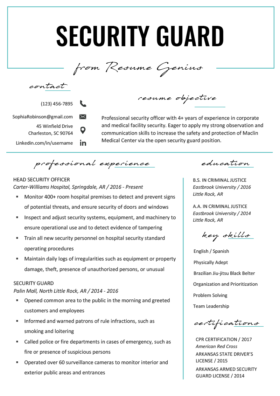 Kindly accept this application from a highly resourceful and skilled professional who is proficient in driving efficiencies, devising safety, security, and loss prevention procedures, and enhancing existing company assets. I am skilled in converting conflict scenarios into positive outcomes through effective problem-solving and complaint handing skills. Currently employed with Carter-William Hospital as the Head Security Officer, I am responsible for monitoring and ensuring the safety of the 400+ room hospital compound. I have successfully managed the scheduling for the securing team which has led to an average payroll saving of $4000. I am pleased to state that my experience in handling emergency situations and theft prevention is above par with your expectations. Additionally, the training that I have received has provided me with the knowledge to cope with unforeseen threats. To further support your base requirements, I can bring an enthusiastic and perspective to this position. I take direction well, but am also capable of working independently. My resume is enclosed for your consideration. I firmly believe that I would be an asset to your team and would very much appreciate the opportunity to discuss how my experience and certifications could contribute to your firm. Need more help? Check out our guide on how to write a great cover letter for more expert tips. Residential cover letters will focus more on experiences, particularly years in the industry as listing employers is probably not very likely possible do to confidentiality agreements with previous clients. Security guards by day, next-level multiple monitor gamers by night..
Corporate security cover letters, unlike residential letters have the ability to highlight previous employers names, with larger corporations garnering more respect with industry HRs. Government security cover letters are faced with a challenge similar to residential security letters as listing employers, job duties and locations may not always be legally possible. Since most personal security professionals work for larger contractor agencies mentioning employers is possible. These cover letters will focus on more personal skills than specific duties as well. As you can see the above cover letter sample utilizes key information in paragraph form and not bullet points. Both are acceptable however if the previous security employer must remain anonymous then writing skills and qualifications in short, non-overly descriptive bullet form might be best.